Suddenly, I have too much to READ. 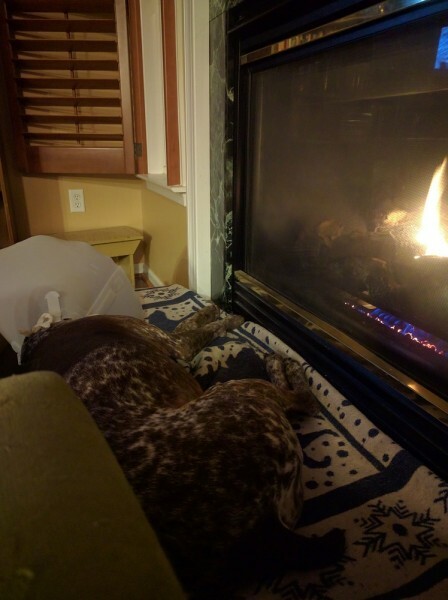 Our comfort-loving dog loves the hearth; it was only a matter of time . . . . Surprisingly adorable: Dancing baby skates. Tolkien meets donut meets moron. And a very good man. Sorry, that was just me channeling an evil wife. Love the picture of Albus in front of the fireplace. Something I've always wanted to have. I think I've mentioned that before. Albus would share with you if he could. I hope Shog's feeling better this morning. I'm with you on the logs. Our fireplace is run on gas, which makes me really nervous—not necessarily the clean gas fireplace which doesn't smoke, but the idea that we've got gas lines running into the house. So much can go wrong with gas lines! Shog had to deeply reassure me that we would not explode before I decided to take this house. I have a picture of a log fireplace derived from romantic movies where someone else cleans the chimney and cleans out the ash and there isn't soot and smoke residue. Someone else also cuts the wood, brings it to your place and stacks it somewhere dry so you can go out with a basket of some sort in bring in to toast marshmallows, roast chestnuts or make popcorn over.